I recently had the chance to try Pine Bros Softish Throat Drops, which is a total flashback to my youth. 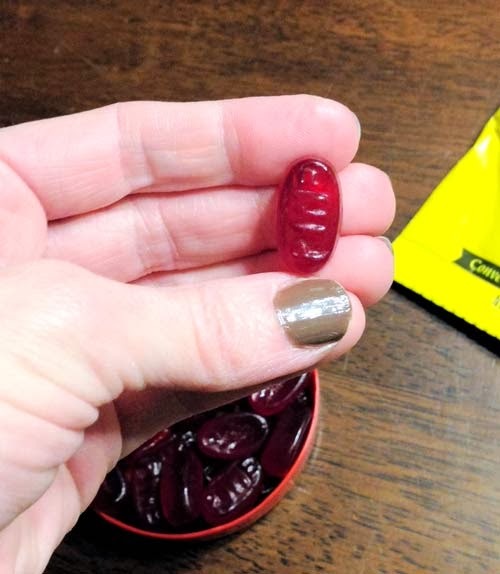 I grew up with more natural throat drop choices rather than the usual mediciney Halls-like lozenges, so when this opportunity came up, I had to take it. It's been years since I've noticed Pine Bros on the shelf, probably because the company went through many years of turnover and changes before Airborne creator, Victoria Knight-McDowell, acquired the brand for her company, 3 Sisters Home Products™. Ms. Knight-McDowell focused on finding original recipes, changing up the packaging to better reflect the brand, and relaunching the product nationally in 2011. This is a product that has been around for 140 years. I can't say I've had the chance to try anything with so much history before! I was super lucky to get a big box of samples in Wild Cherry and Honey flavors. Included were both packets of 32 drops and plastic tins called "pucks," with 26 drops. I keep a honey flavored puck by my bed every night. So ironically (or not? ), I got a cold when these arrived and with that cold came a nasty sore throat and mild cough. Perfect timing, for better or worse. On top of that, it's been below zero for weeks, so the air is dry and unpleasant. The honey drops have been just what I need to keep my throat feeling comfortable without the medicine taste of other drops. I like the subtle flavor that's not overly sweet. 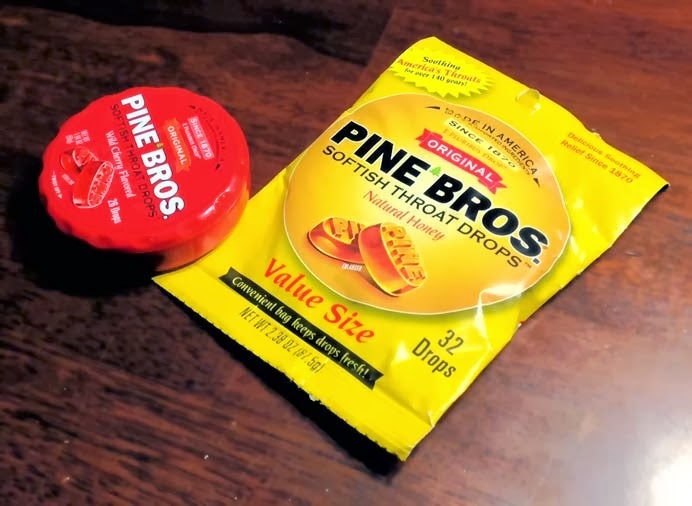 It takes some getting used to the chewy, yet hard texture, which just begs to be bit upon (don't do that), but I do really like the Pine Bros throat drops. 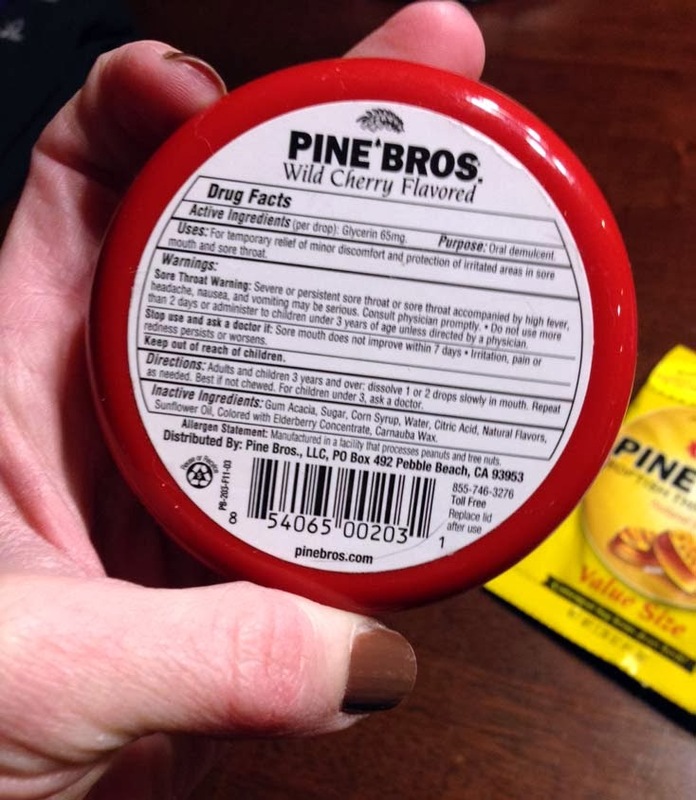 Pine Bros throat drops are available nationwide, but if for some reason you can't find them, first insist that the store manager order them, then visit the Pine Bros online sales site to order them for yourself. They're pretty awesome and worth a try. I rarely enjoy throat drops. Really, rarely. These are good enough that I've had a few honey drops since my cold went away. They're good no matter what. Pine Bros is quite active on Facebook and Twitter, so definitely visit their pages and look for giveaways, contents, product information, and more! Again, I received one or more of the products mentioned above for free using Tomoson.com. Regardless, I only recommend products or services I use personally and believe will be good for my readers. This is no joke. I take my review job seriously because honesty matters.